An Easy Pumpkin Muffin Recipe is all that’s needed to jump start you into the Fall baking season. 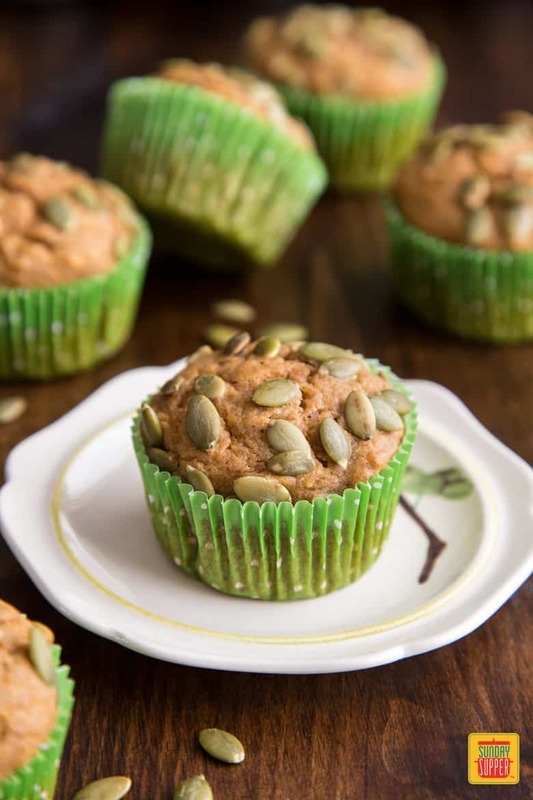 These muffins are packed full of pumpkin puree and warm sweet spices. They are perfect for breakfast or a midday snack. I love summer produce, and I’m sure gonna miss them. But Fall is my favorite season because the temperature is mild and baking is allowed 24/7. And I sure don’t mind starting my day with an Easy Pumpkin Muffin Recipe or one of our other pumpkin recipes, like our Pumpkin Cream Cheese Muffins, a Sunday Supper favorite. This recipe for our Easy Pumpkin Muffins makes about 11 to 12 regular size muffins, depending on how full you want them to be. Or you can always make 6 jumbo bakery style pumpkin muffins instead. 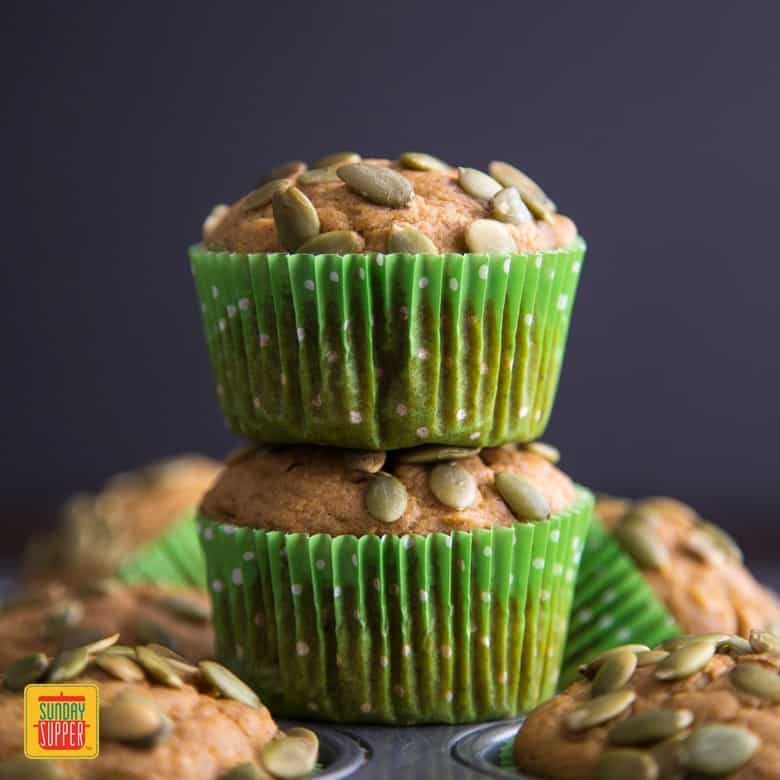 These easy pumpkin muffins are made with all basic ingredients and you get a chance to test out our homemade pumpkin pie spice recipe from a couple days ago. I used canned pumpkin in this recipe, not pumpkin pie filling, but just pure canned pumpkin. If you are ambitious, you can make your own homemade pumpkin puree by roasting a whole pumpkin. Scraping out the flesh and pureeing in a food processor or blender. However, for the sake of simplicity, let’s just use canned pumpkin here. I typically make regular size muffins in a cupcake pan. But you can make these pumpkin muffins into larger bakery style muffins if you have a large 6-cup muffin pan. 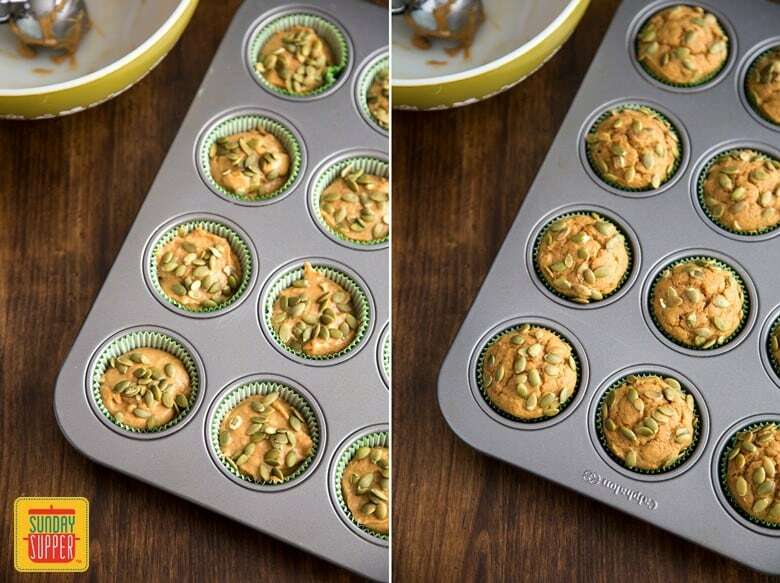 Larger muffin pan liners may be difficult to come by, you can skip them and just spray the pan generously with non-stick cooking spray. You will be able to make about 6 jumbo bakery style muffins with this recipe. If baking larger size muffins, you must increase the baking time to 27 – 29 minutes until it is cooked thoroughly. Check as usual by inserting a toothpick in the middle, if it comes out clean, your muffins are done. 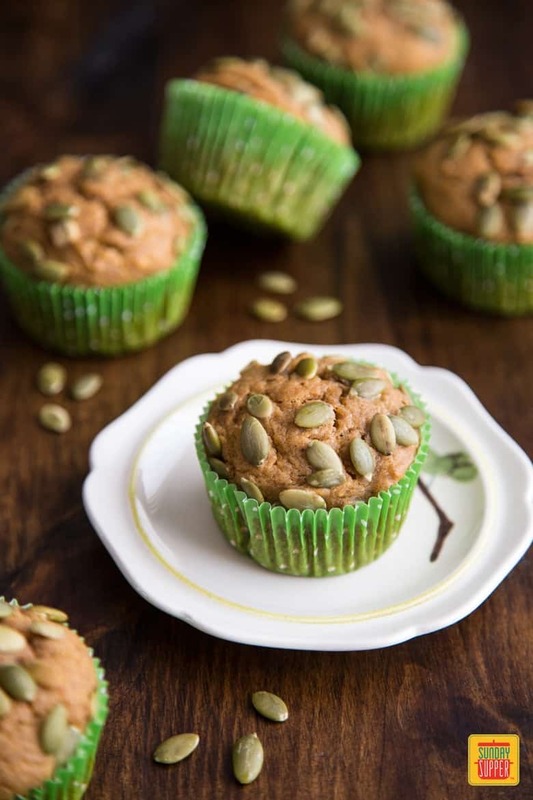 Pepita is a nice touch on these easy pumpkin muffins. They give a little bit or texture and crunch, and some visual interest to make them look more than just some basic pumpkin muffins. 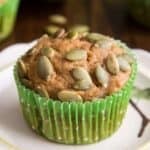 So try this Easy Pumpkin Muffin Recipe out and enjoy! 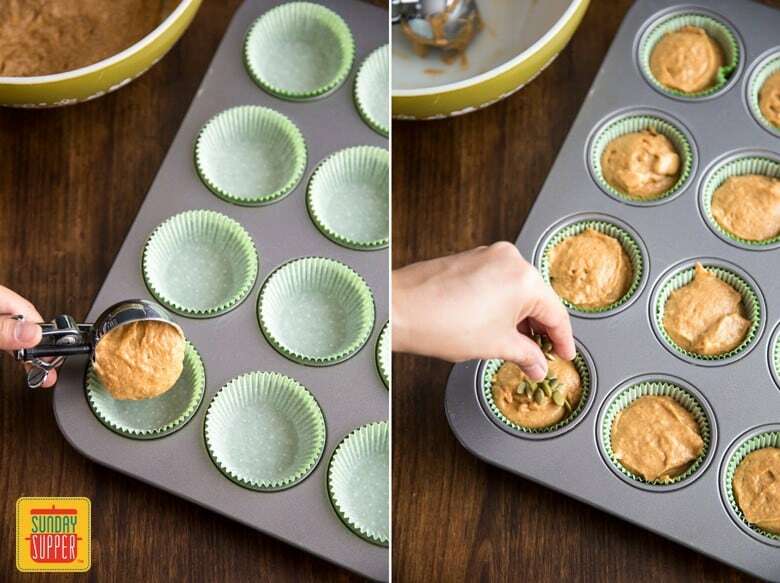 Line the cavities of a regular size muffin pan with paper liner or spray with nonstick spray. In a medium bowl, add flour, sugar, baking powder, salt, pumpkin pie spice and mix thoroughly with a whisk. Add pumpkin puree, egg, milk, butter and vanilla extract to a large bowl and mix with a whisk until smooth. Fold the flour mixture into the liquid mixture with a spatula until just combined. Divide batter equally into the previously prepared muffin pan. For fuller muffins, divide batter into 11 cups, otherwise divide evenly among 12 cups. Sprinkle about a teaspoon of pepita over the top. Bake for 20 - 22 minutes until a toothpick inserted in the middle comes out clean. Remove muffins from the pan and let cool completely. Got me with pumpkin seeds 🙂 Pinned !